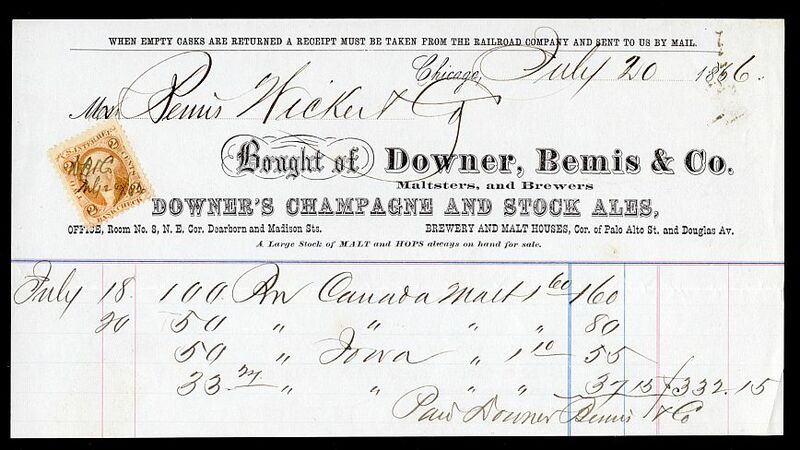 Checks of the Downer & Bemis Brewing Company of Chicago are familiar to many check collectors. There are four distinct vignettes to this series. Vignettes I and II have a train in the foreground. Vignette I has a building with the flag on the left, while vignette II has the same building enlarged on the right. Vignette III has a double-roofed ice house in the center. In vignette IV a stable replaces the ice house. All of the checks except for the ones with revenue imprint RN G-1 were printed by Ed Mendel. The checks with RN G-1 imprints are the product of the Western Bank Note and Engraving Company. Vignette I. The author’s collection contains check #1271 dated January 10, 1868, and check #3633 dated November 6, 1869, both printed in purple and imprinted with an RN B-1. Examples with vignette II are: check #4464 dated July 2, 1870, printed in purple, with RN B-1; check #5725 dated September 11, 1871, printed in green with RN C-1; checks #6689 dated June 24, 1872, and #7942 dated April 14, 1873, both printed in purple and bearing RN E-4. The examples in the author’s collection with vignette III are as follows: checks #8466 dated August 21, 1873 and #11092 dated May 11, 1875, both with RN D-1; checks #12329 Dated February 9, 1876, and #13345 dated October 10, 1876, with RN F-1; checks #14500 dated June 26, 1877, and #15412 dated May 10, 1880, with RN G-1. All are printed in purple. Vignette IV appears on checks #16225 dated August 6, 1878, and #20541 dated February 4, 1882. Both are printed in violet and bear RN G-1. There are at least two settings of the checks bearing vignette IV. They can be distinguished by the printed year, one being 18__ and the other, 188_. The illustrated check, dated early in 1883, bears a handstamped change of name from Downer & Bemis Brewing Co. to Bemis & McAvoy Brewing Co. This article was run in the October – November 1994 issue of The Check Collector. In his 1994 article Bill states that his check #5725 with vignette II is printed in green and bears an RN C1 imprint. The checks I am familiar with that are printed in green have vignette I and bear an RN B1, and the checks with C1 imprints and vignette II were printed in purple. There are other variations as well. Also, in the October – December 2005 issue there was a short article featuring two other rather unusual Downer & Bemis items. This is that article, updated with more current information, plus a record of the brewing ventures of Henry V. Bemis, from a eulogy published in the Brewers Journal, Volume 31, 1906. Downer & Bemis was a Chicago brewing firm. Many of their Civil War tax era checks survive, most with stains from being stored in malt kegs, or so I have heard. An article discussing their various vignettes and the imprinted revenues they used was printed in The Check Collector some years ago. Neither of these items appeared in it. This 1866 receipt for the purchase of malt was issued to Bemis, Wicker & Co., a malt-house which was a different venture involving Henry V. Bemis. The second item is a check made over for use by Downer & Bemis from the Tivoli Garden Company. Downer & Bemis used checks of the First Natioinal Bank as well, so there was no need to alter the bank name. Do unaltered checks of the Tivoli Garden Company exist? Or did one survive only because Downer & Bemis used it and stored it? 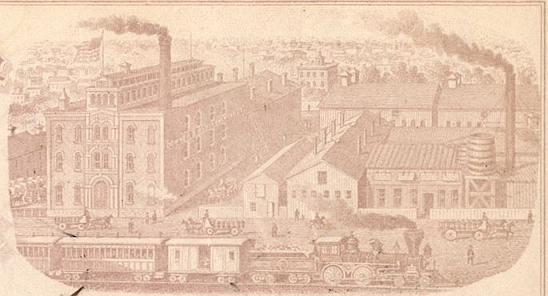 “… In the latter part of 1860 Mr. Bemis and Corydon Downer, a son of Truman Downer, formed a partership under the name of Downer, Bemis & Company, and built a small ale and porter brewery on the south side, near the Illinois Central Railroad roundhouse, at Sixteenth Street and the lake. Shortly after Mr. Downer retired from the business, which was continued by Mr. Bemis, who, however, retained the old firm name. Corydon Downer removed to Omaha, Nebraska, and later to the Black Hills, South Dakota, continuing in the brewing business there. “Mr. Bemis was also interested in the malting firm of Bemis & Smith, who leased a malt-house on the west side of South Park avenue, this firm being succeeded by Bemis, Wicker & Company. 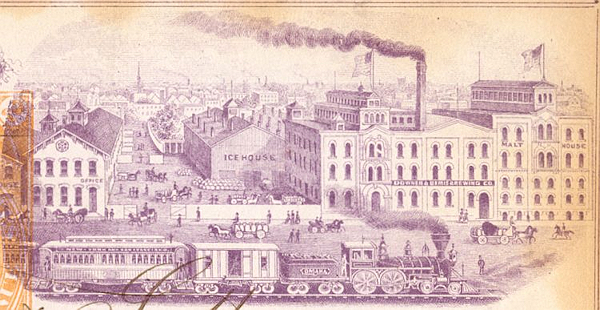 Later a lager brewery was built by Bemis & Rindge, adjoining the malt-house on South Park avenue. Mr. Rindge retired from business about 1864, when the brewery, and also the malt-house, was purchased by Downer, Bemis & Company. “In 1865 John McAvoy bought an interest in the business, and in 1866 a stock company was formed under the name of the Downer & Bemis Brewing Company with Albert Crosby, president; J.H. Wicker, treasurer, and H.V. Bemis, secretary. Brewers Journal, Volume 31, 1906. Reporting on the suicide of Henry V. Bemis at age 72.